Want to know what I hate? Tumblr. Okay, I don't hate it, but I hate how you end up seeing something amazing but there ends up being no source. You click on the image, only to be bounced around from one Tumblr page to another and yet, you still can't find the info you're after. That is what happened to me a month or so ago when I first stumbled up a swatch of Savina's Purple Hologram. Of course, when it comes to a polish I want, I tend not to stop searching until I find a way to make it mine. Luckily I was able to find one! Want to see more? Purple Hologram is a pale, pinky-lavender, actually, it is quite similar in tone to OPI Lucky Lucky Lavender, but it's packed with holographic glitter. The formula is a bit thin, and I ended up needing three coats for full opacity, but the formula is smooth and applies with no issues.The glitter is of medium size, and looks almost sugary when not in direct lighting. The holo effect is strong when it's in the right light, but you don't get consistent flashes all the time. The holo glitter gives this polish a gritty texture once dry, so this definitely needs a few layers of top coat. The brand, Savina, is totally new to me. When I was initially searching for it, I was unable to find their official site. I ended up buying my bottle from a seller on eBay, for about $5, but 8ty8 Beauty Supply carries Savina, and only charges $2.88 per bottle here. I've yet to order from them, as you have to call an request the shipping quote for Canadian orders. That makes me think it is probably a ridiculous price if they aren't willing to just post it on the site. On the bottle, there is a web address for Fantasy Files, but the site seems to be defunct, as it only seems to result in error messages. Huh. 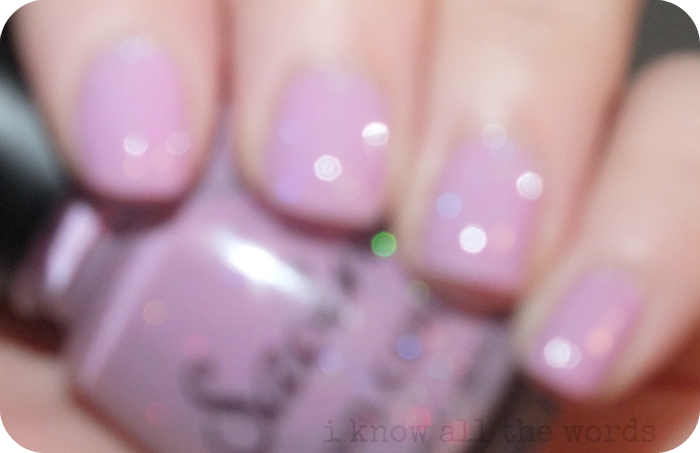 Have you ever used Savina nail polish?